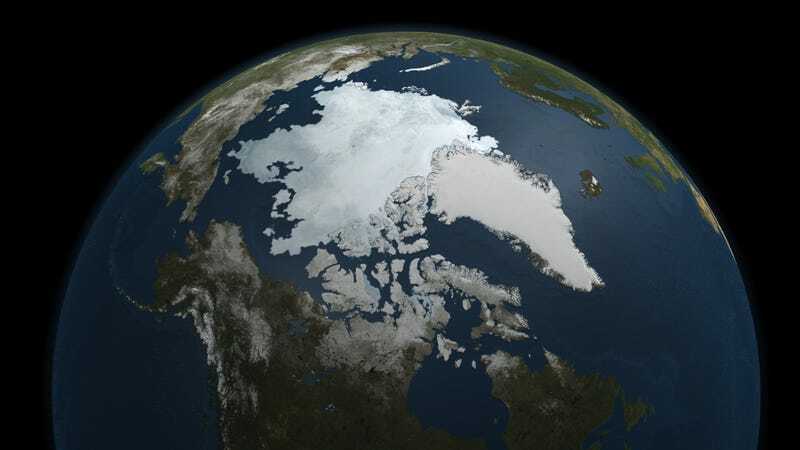 The Canadian government is claiming 463,323 square miles (1.2 million square kilometers) in the Arctic, a wide expanse of territory that includes the North Pole. Trouble is, Canada hasn't yet fully mapped the area, nor does it have the scientific evidence to back the claim. Along with Russia and Denmark, Canada is currently in a mad territorial dash to claim all that juicy, globally-warmed area for itself. Because, you know, oil. Similar, but weaker, territorial claims are also being made by France and the United States. In a characteristically belligerent gesture, Russia made a territorial overture back in October, saying it would restore a major Soviet-era military base in the Arctic; President Putin has angrily dismissed suggestions that the region should be placed under the jurisdiction of the international community. And now Canada is making its moves, albeit through the UN-channel — and despite the country's own admission that it doesn't yet possess all the evidence required to make the claim. The submission, which the Canadian government says is preliminary, was made last week to the United Nations Commission on the Limits of the Continental Shelf. The federal government wants its scientists to finish mapping a giant undersea mountain range that Ottawa claims will secure the sea floor under the North Pole. The undersea Lomonosov Ridge runs from near Ellesmere Island northward over the pole and would be the geological basis for a Canadian territorial claim. Scientists suggest it looks as if the ridge is connected to the Canadian land mass, but Canada has only done aerial surveys of the ridge once it gets past the pole. "The reality is the Lomonosov Ridge wasn't fully mapped in the submissions that my department did," [Foreign Affairs Minister John] Baird said. "And, frankly, we think it's important when you do this extensive mapping, we wanted to get the entire Arctic map, including on the ridge." Arctic experts point out that Russia and Denmark also argue the Lomonosov Ridge extends from their shores. International law expert Michael Byers points out the pole lies on the Danish side of the ridge. It also lies on the Danish side of a line that runs equidistant from Ellesmere Island and Greenland. "In five or 10 or 20 years, we are going to have to admit that the North Pole is not Canadian," said Byers, who teaches at the University of British Columbia. "(Harper) does not want to be the prime minister seen publicly as having surrendered the North Pole, even if the scientific facts don't support a Canadian claim. What he's essentially doing here is holding this place, standing up for Canadian sovereignty, while in private he knows full well that position is untenable." Interestingly, one possible outcome is that all three High Arctic neighbours will get sizeable chunks of the Lomonosov Ridge. If that should happen, Canada would still do well, as the ridge would be equally divided between the three countries, putting Canada's boundary 230 miles (370 km) past the North Pole.